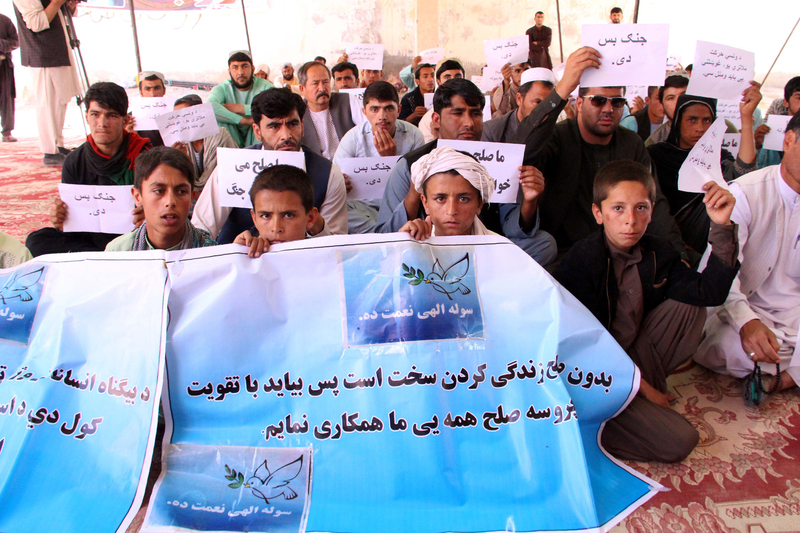 HELMAND -- A peaceful protest started by a group of young men in Lashkargah, Helmand Province, is quickly spreading across Afghanistan in an unprecedented movement that includes all segments of society. Dozens of Helmand Province residents set up a tent in Lashkargah on March 24, a day after a car packed with explosives blew up outside a stadium in the city, killing at least 17 civilians and wounding 55. While no group claimed responsibility for the blast, the protesters are urging the Taliban to make peace and stop killing civilians. The demonstrators are calling themselves the "People's Peace Movement". They include tribal elders, civil society activists and relatives of victims killed in violence and have the support of the Afghan High Peace Council (HPC), Afghan Ulema Council and political leaders. In a rare move for the conservative province, women joined the sit-in March 27. "Stop making us widows and making us cry over the death of our children," a woman said in Helmand last month, according to Voice of America (VOA). The grass-roots movement began with a single tent set up in Lashkargah. Now entering its third week, it has quickly spread to Gereshk and Nawa districts of Helmand Province. Residents of Kandahar, Zabul, Uruzgan, Farah, Bamiyan, Balkh and Nangarhar provinces also have set up tents in support of the population of Helmand and its call for peace. The demonstrators will continue with the sit-in and not return to their homes until the Taliban welcome their calls for peace, said Ahmad Jan Khadem, 32, a leader of the Helmand peace movement. "The Taliban still have not quit fighting. So far, they have not shown any commitment to peace," he told Salaam Times. "How long should we continue fighting?" he asked. "Let's make peace." Some of the demonstrators began a hunger strike March 29 after their demands for a cease-fire between Afghan security forces and the Taliban were not met. "We fasted for 50 hours," Khadem said. "The government promised us to cease fire, but the Taliban did not announce a cease-fire." After several of the hunger strikers were hospitalised, local religious scholars and tribal elders intervened to end the fasting and assured demonstrators that peace talks with the Taliban would take place. "We are tired of war; they are being killed and so are we, but we do not know why they [Taliban] do not make peace," Bacha Khan Mauladaad, 27, who participated in the hunger strike, told Salaam Times. "God and the Koran orders [Muslims] to make peace, but so far, the Taliban do not obey God and the Koran," he said. "We are strongly determined not to fold our tents as long as peace has not returned," Mauladaad said. The demonstrators, including the women, planned to march more than 100km to Taliban strongholds in the province, such as the Taliban-controlled town of Musa Qala, to try to persuade the militants to stop fighting. But the Taliban warned the People's Peace Movement participants in a WhatsApp message sent to journalists on March 28. "If something were to happen, then responsibility will be placed squarely on your shoulders because you understand that we are at war," the Taliban said, according to AFP. Following the warning, the Taliban did not allow the demonstrators to go to Musa Qala for talks, Rahmatullah Hemat, 25, a nurse at Helmand Boost Hospital and a member of the people's movement, told Salaam Times. "The Taliban did not let the public hold direct talks with them in Musa Qala District," he said. Hemat pleaded with the Taliban to stop their violence. "Do not kill Afghans anymore. Do not kill the children of our sisters and mothers. Let us live a life," he said. "We salute the Helmand citizens calling for peace and cease-fire," HPC chairman Mohammad Karim Khalili said April 3 at the HPC's general assembly in Kandahar. "Today, the call for peace has started from [Helmand], and this call will expand to the entire country," he said, adding that the whole world is watching. Peace is possible if Afghans rise together, he said. Afghan President Ashraf Ghani also expressed support for the People's Peace Movement on Twitter. "I welcome the campaign in Helmand and other provinces where women, elders and youth have gathered to seek peace and raise their voices in unison against war and violence. And I hope this peaceful national movement will be strengthened and supported by the people in large numbers," he said. Helmand Governor Hayatullah Hayat thanked the protesters for their efforts. "Helmand's protesters showed to Afghanistan and to the world that they are the real victims of terrorism and that they are the most thirsty and hopeful of all for peace," he said in Lashkargah April 5. He called on the Taliban to "welcome this popular movement, stop fighting and accept the nation's call for peace so that Afghans can get rid of this fighting and misery and can live a peaceful life." we hope that united nation end fight in Afghanistan. other ways afghan are tired from fighting , we knows well that the fighting are going forward in Afghanistan not related to Afghan it belong to foreign, end the killing of Afghani. "We salute the Helmand citizens calling for peace and cease-fire," said Mohammad Karim Khalili, chairman of Afghanistan's High Peace Council. 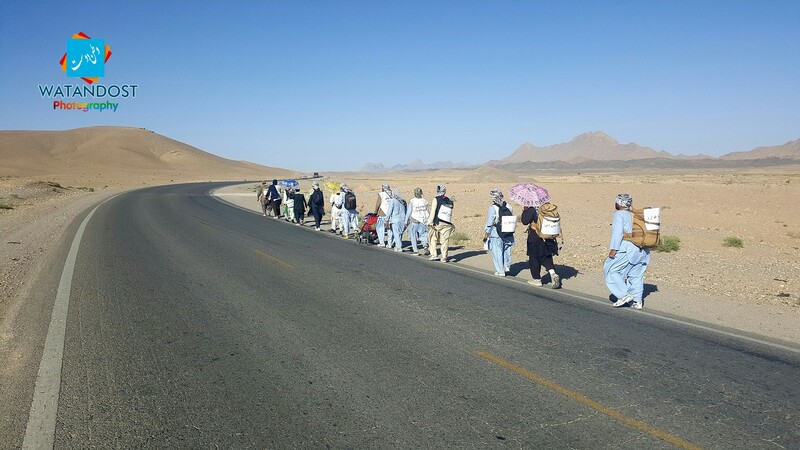 So far, 14 members of the movement are walking to the capital to urge the Taliban to make peace and stop killing civilians.